Livescribe has just launched its Pulse Smartpen – what looks like an ordinary writing instrument is actually a computer. Housed within a pen-shape case, this nifty little device is capable of digitally capturing handwriting in addition to recording audio simultaneously, synchronizing it to the writing. As I suspected, it isn’t compatible with any paper (now that would definitely make it sell like super hot cakes all over the world), but instead relies on a special Dot Paper Notebook. Whether you are a student, a professional or just an ordinary bloke who often gets involved in note taking situations, the Livescribe Pulse Smartpen sounds like what the doctor ordered. According to Livescribe, Inc. Founder and Chief Executive Officer Jim Marggraff, “Pulse is a new type of mobile computer that supports the four basic modes of human communication – reading, writing, speaking and listening. Using an embedded speaker and display for audio/visual input, and microphones and a pen for audio/visual output, Pulse advances the power and flexibility of mobile computing – it’s the missing link that now connects the paper and digital worlds.” The Pulse Smartpen is tipped to hit retail markets this March, and will come in a couple of flavors for different budgets. Those who opt for the 1GB model will have to fork out $149 while folks who want double the memory need to top that initial figure with another $50. 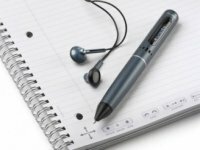 To get an idea of how far 1GB can bring you with the Pulse Smartpen, that amount of storage capacity is enough for roughly 100 hours of recorded audio and 16,000 pages of digital notes. Each Pulse Smartpen is housed in anodized aluminum that doesn’t attract fingerprints unlike other glossy gadgets, tipping the scales at 1.3 ounces while measuring 6.1″. It runs on a Samsung ARM 9 processor and is powered by a rechargeable lithium battery. Hey if anyone wants a 5% discount on the Pulse Smartpen you can use this 5% discount code: SCRIBE5A22 at livescribe.com. Pen helps make studying easier and more efficient. It really helped me write less and pay more attention in my history and political science classes. Instead of trying to write everything the professor was saying I would just write key words and then later as I was studying I would tap my notes and have the audio replayed. It was also really beneficial for my organic chemistry class because with the Livescribe Desktop application I was able to play back how I wrote my notes and saw where molecules would go.